Happy Valentine’s Day! Okay, so I know I’m a bit early, but I thought we would take a look at some beautiful vintage girls clothes that could inspire a touch of Valentine’s sewing for our favourite little ones. 50s McCall’s 2157 Girls Party Dress with Heart-shaped Embroidered Pockets. If you don’t have time between now and Valentine’s Day to create an entire garment, these appliqué pockets could be the perfect solution. Use scraps of your favourite fabrics to make embroidered hearts trimmed with lace and then stitch onto a ready made skirt. Left: Butterick 7667 Vintage 50s Toddler Heart Sunsuit & Dress. 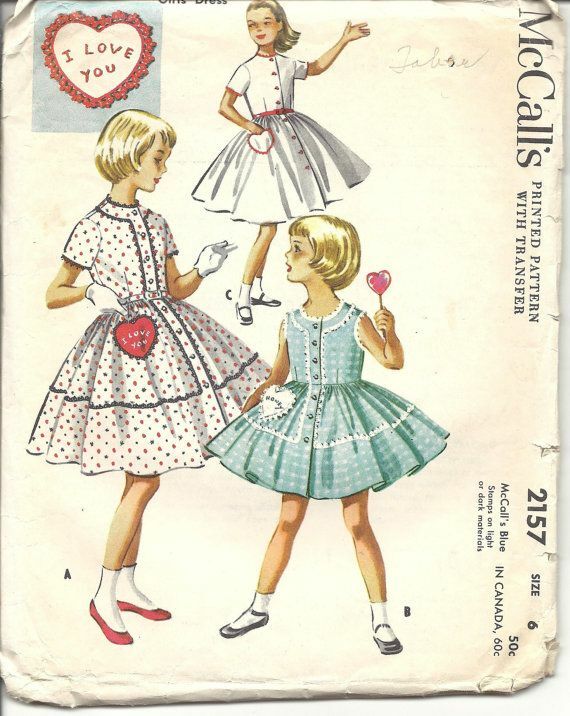 Right: Advance Pattern 1940s Toddler Girl’s Back Button Dress 4249 with Puff or Cap Sleeves &Heart Pockets. 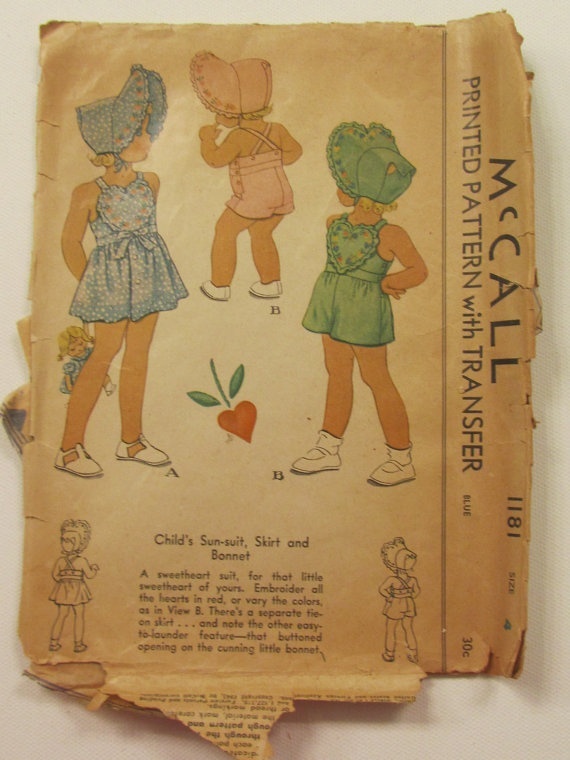 1950s McCall Sewing Pattern 1181 Childs Sunsuit. If your time allows for the creation of one of these gorgeous sunsuits or dresses, team them with a long sleeved top and tights (it’s only February after all!) and make them with a bit of growing room to ensure they see the sunshine in the summer! 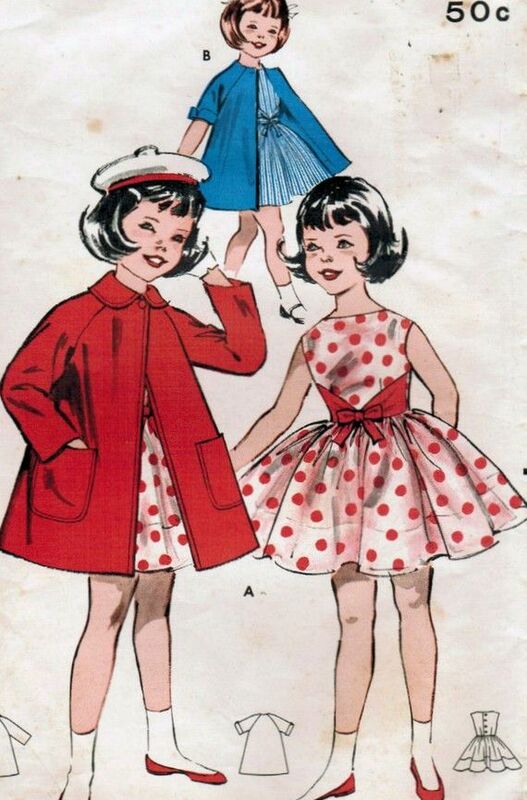 Left: Marian Martin 9061 Girls 1950s Sundress, Jacket & Bonnet with Applique Hearts. Right: 1940s Marian Martin Mail Order Pattern 9100, Little Girl’s Romper with Heart Shaped Pocket. I love the extra detailing of these Marian Martin patterns. The scalloped seaming on the dress balances the appliquéd hearts perfectly and the waist ties on the romper create a fitted effect. Vintage 1960 Butterick 9717 Sewing Pattern Girls’ Dress and Coat. If you’re not a big fan of hearts, but want to create a garment that still has that Valentine’s feel, stick with red. I love the fabric choice for the design above- it would make the perfect Valentine’s outfit! Left: The Girl Inspired’s Sweetheart Dress. Middle: Twinkle + Whim’s Red Heart Dress. Right: Shannon Cook (pattern designer)’s Sweetheart Dress. Alternatively, be inspired by modern sewers’ interpretation of the trend! I love the way the retro silhouette has been updated with this heart-shaped open back. It’s a subtle and girly twist that would be perfect all year round. I’d love to hear from you if you have any Valentine’s sewing planned, or if you’ve already whipped up something struck by Cupid’s arrow- just comment or leave a link below! Happy Valentine’s sewing! Hi April, No I’m afraid I don’t. These are all design images I’ve found online and saved as inspiration for my own pattern drafting. Similar patterns often appear on etsy/eBay, so it’s worth keeping an eye out there. Sorry I can’t give you more help. Good luck!